On August 14, 2018, a Texas DPS Trooper conducted a traffic stop on a suspicious person in the 12700 block of Hwy 155 N. in Tyler. The Trooper made contact with the suspect who was later taken into custody on a Peace Officer Warrant. While the Trooper was speaking with the suspect, he observed a black bag in the front passenger seat, within reach of the suspect. The bag was open and in plain view, the Trooper was able to observe two handguns and several handgun magazines. The Trooper was able to secure the weapons. During a field interview, the Trooper requested assistance from the Smith County Sheriff’s Office. Deputies and Detectives responded to assist with the investigation. During the interview, the suspect made several statements regarding threats against himself and others. 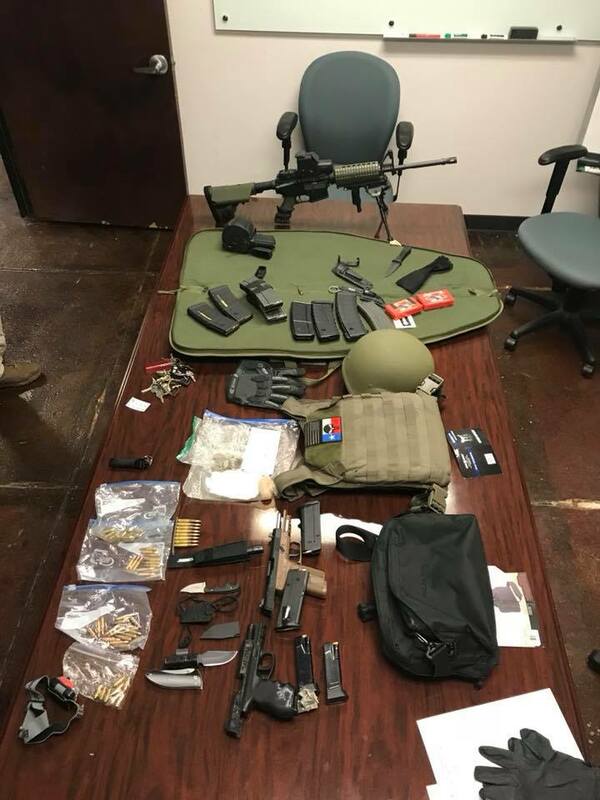 He was wearing body armor, was found to be in possession of multiple firearms including both pistols and rifles. He was also in possession of several high capacity magazines and multiple knives. He was believed to be a danger to himself and others, was taken into custody and transported to an area hospital for evaluation. After the evaluation is complete he will be placed in the Smith County Jail on weapon charges. Working together, showing great trust and communication, both the Texas Department of Public Safety and the Smith County Sheriff’s Office were able to safely encounter and deal with this armed suspect. This individual who posed a serious risk to both law enforcement and the community was safely handled and taken into custody without incident.